Blackhawk DE-TBK Manual Entry Tool Kit (Standard) FREE SHIPPING! This backpack is designed to carry a SOHT Hallagan tool, a Thundermaul Sledge Hammer and Boltmaster Bolt Cutters. It is made of 1000 denier NyTaneon nylon and is heavily padded with closed cell foam. Each tool has its own pouch and hook & loop retention straps. The backpack itself is contoured to the shape of your back. The shoulder and chest straps, along with the waist strap are fully adjustable. 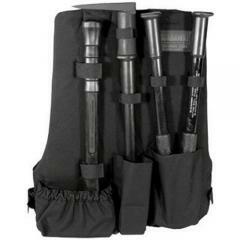 ©2002-2019 CopsPlus.com: Blackhawk DE-TBK Manual Entry Tool Kit (Standard) FREE SHIPPING!